First Licensed in 1782, Mulligans Pub Dublin, located in Poolbeg Street, is one of the oldest pubs in Dublin and and has a long and colourful history. The ornate lettering over the door ‘John Mulligan’ is said to be the original. Mulligans has a reputation for serving the best pint of Guinness anywhere and many famous people have sampled it over the years. John F. Kennedy was a regular in 1945 when he worked as a journalist for the Hearst corporation and many international theatre and film actors visited. For many years Mulligans has attracted customers from all walks of life. Newspaper workers from nearby were daily visitors as were dockers, unemployed, students and professors who mixed in the unique old world atmosphere. A group called “The Society For the Preservation of The Dublin Accent” used to hold meetings there. There are three bars and a large upstairs lounge. The decor and furniture is largely Victorian and Mulligans is one of the few pubs which retains that authentic Dublin atmosphere. It is mentioned in James Joyce’s short story ‘Counterparts’ and it is thought that Joyce wrote portions of ‘Ulysses’ there. 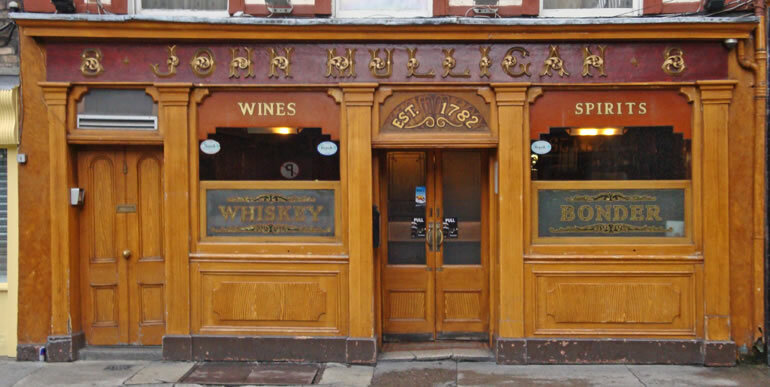 Despite its age and its lack of concessions to modernity Mulligans remains one of Dublin’s most popular and lively pubs and has to be on the list of places you must visit while in Dublin.